Once upon a time, coffee was abundant but really not that good. Then along came the coffee craze and suddenly everybody was drinking well-crafted coffee drinks. More importantly, everybody was drinking coffee suited exactly to their tastes. As the nation became entranced with the beverage, it became imperative for us to get our coffee fix anytime, anywhere. The coffee chains were only too happy to oblige. Running concurrently with this phenomenon was an increase in the ever-exacting standards of the airline industry. It only makes sense; efficiency is next to safety when we take to the skies. No longer would the passenger who insisted on stuffing all of their luggage into the overhead bins be tolerated. The size of carry-on luggage became quantified and baggage companies stepped in to create TSA approved bags. Fast forward to 2009 and we have the inevitable conclusion: airports full of travelers all balancing a cup of coffee while struggling with their nearly identical carry-on bags. Clearly, something had to be done. Enter the TuGo Cup Holder. Simply attach in-between those two bars (don’t tell me you use something different!) 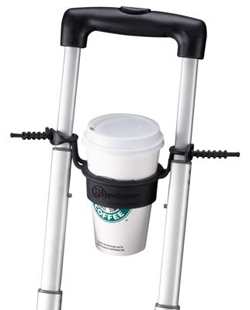 that comprise the handle on your luggage and rest your double soy latte half cream mocha right on in there.